Employing illusions to do work, etc. Garaiya Ogata (尾形　ガライヤ, Ogata Garaiya) is the leader of the Dragonfly Army. They're also the master of Kaisen Azuma and Kujiru Kesa. Nearly all of the Dragonfly Army's soldiers are their shikigami. Garaiya is soft-spoken and polite. 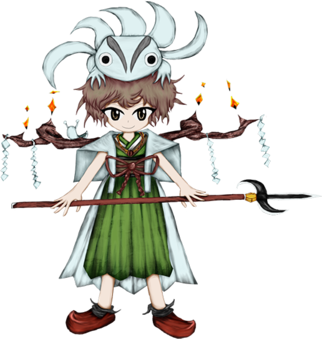 They're kind to both humans and youkai, and most of them respect their strength. They're mild-mannered and has never been seen to be overly angry, even when scolding their pets. Garaiya is also hopelessly idealistic and wants to find a ruler that would be a hero for Mugenri. Garaiya is able to form shiki with many youkai, employing multiple shikigami to work for them at once. Garaiya is a master of both Taoist magic and martial arts. It is implied that this is how they are able to control Kaisen and Kujiru. However, if they focus too much power on the two of them, their own skills are impaired. Since long ago, Garaiya wanted to find a suitable ruler for Mugenri, a hero. At first, they supported Taira no Fumikado with their plans to become the True Emperor, but after they became a rogue fugitive, they gave up on their plans. Shortly after, Fumikado's deceased servant, Taira no Chouki, wanted revenge on Fumikado so they trained under Garaiya's tutelage to become stronger. Their full name is Garaiya Ogata (尾形　ガライヤ). Garaiya is based on Jiraiya (自来也 or 児雷也), originally named Ogata Shumo Hiroyuki. They were a ninja from the Japanese folktale The Tale of the Gallant Jiraiya (児雷也豪傑物語, Jiraiya Gōketsu Monogatari), who was known for riding and shapeshifting into toads. In the same story, Jiraiya fell in love with Tsunade (綱手), who could summon or transform into snails or slugs. This may explain why slugs, as well as toads, are frequent around Garaiya. According to JynX, "Garaiya" is written as "我來也 (simplified: 我来也)" in Chinese, which translates to "I have come" or "Here I come". They appear of short stature, with short, pale-brown hair and very light hazel eyes. A brass necklace with a red orb hangs around their neck. They wear a forest-green, sleeveless robe with a brown and black obi, tied with a red rope. They wear a white shawl that also acts as a cape. Two curling branches extend from behind their shoulders, with paper streamers and what appear to be orange crystals. They wear red shoes that resemble wooden clogs, with dark grey garments underneath. While Chouki was training under the tutelage of Garaiya, the Dragonfly Castle appeared before Chouki, which Garaiya took as an omen acknowledging them as the New Emperor. The idealistic Garaiya wanted for the emperor to be a “hero figure” to Mugenri, but unknown to them, Chouki actually had no interest in ruling. Knowing that Fumikado will eventually come to the castle and fight for the emperor’s title, Chouki waited for them inside the castle, with the intention to kill and have revenge on Fumikado. In all routes, after Kujiru and Kaisen are defeated, they go back to Garaiya and tell them what happened. Garaiya and their pets (in animal forms) fight against the heroes in order to prevent them from reaching Chouki and the Dragonfly Castle, but is defeated easily, since Garaiya was weakened due to using most of their power to enhance Kujiru and Kaisen, along with powering the majority of the Dragonfly Army. Kujiru Kesa and Kaisen Azuma are both Garaiya's pets and shikigami. They adopted Clause after finding them and saved them from being homeless. Garaiya still finds Clause annoying like everyone else, despite having them work under them. ↑ Kama-juumonji (鎌十文字, lit. "scythe cross"): a type of cross-shaped spear with two scythe-shaped protrusions perpendicular to the blade. According to Kaisen and Kujiru, Garaiya is actually younger than them, but the pets respect them nonetheless. Garaiya has some similarities to Byakuren Hijiri from the Touhou Project . Both are kind, polite and loved by youkai. Also they're idealistic and have powers based on enhancement. They're also leaders of a group that opposes an imperial faction. This page was last edited on 16 April 2019, at 04:12.